Even the best golfers will spend a lifetime tinkering with and trying to perfect his or her golf swing. It’s what makes golf so challenging and rewarding. We’ve already given you a glimpse into a putting lesson and the chipping techniques that our coaches use in class, so now it’s time to look at the golf swing progression. 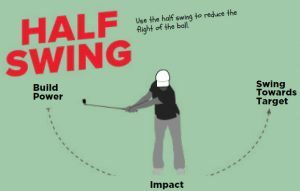 We will focus on the half swing, L swing, and full swing and how coaches introduce these in class. The first thing our coaches try to preach to students is that no two golf shots are alike. So just because a student might be really good from one distance, doesn’t always mean they’re going to be playing from that distance. 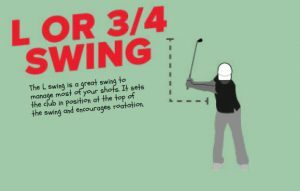 Whether students are working on half swing, L swing, or full swing, our coaches are equipped with a variety of skill exercises and fun games to help continue each players’ improvement. Some class favorites are Build a Green, where a combination of cones and ropes are used to create multiple greens at various distances. Each green will require a different shot in order to successfully land the ball inside the ropes or on the green. Our coaches and students are encouraged to get creative and use different things about them to create additional games. For example, some coaches have students aim for basketball hoops to help encourage additional height and distance control on a particular shot. Other games can be played on baseball fields with various distances counting towards a single, double, triple or home run. Team games are highly encouraged to continue to grow the team building aspect of a TGA class. Like all things, each of these shots requires plenty of practice — that way you know when to use them out on the course. We recommend practicing your swing at home in front of a mirror. You don’t even need to use a club if the space isn’t available. 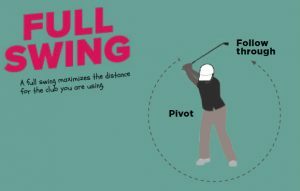 If you do have room in the yard, set up a driving range using cones or something similar to mark off every 10-15 yards. Make yourself start with hitting shorter, half swing shots before working up to the longer full swings. After all, practice makes perfect. Learn more about other golf skills at a TGA program near you.